Bear stock market is one part of market life. You can always find a bear market situation in some stock, market sector, regions or other parts of financial markets. 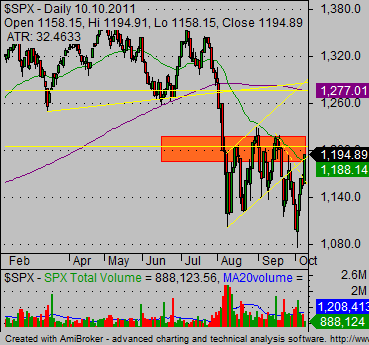 You can find it even in times when the general market indexes are in a bullish situation. You should know how to trade bear market stock picks and their price declines. These moves often generate huge profits for well prepared traders. There are two major trend moves. 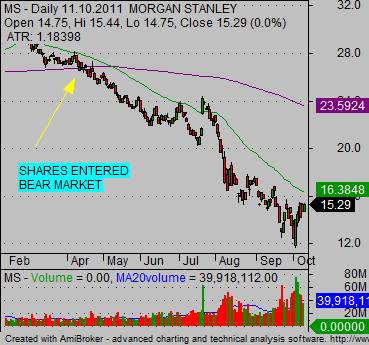 Bear market trend – downtrend – and bull trend – uptrend. It is important for you to know that stock, sector or all market are in bear trend situation. Why? Because then you defined the major trading direction. 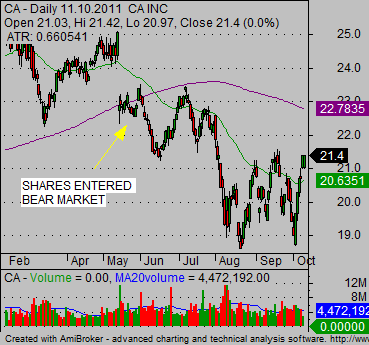 The major recommendation is that when chart analysis tells you that stock or sector or market are in bear territory then it is not very good to be brave and buy a lot of shares. The preferable type of trading is short selling. How to define a bearish situation? Quite simply. Use two major moving averages, the 50-day and 200-day moving averages, to define the situation. When the price of analyzed instrument moves below both these averages, we are in a bearish situation. The best stock trade strategy for such instrument is to expect further declines, i.e. to do short selling. Here are examples of downtrend in some stocks. As you can see, these stocks moved into negative i.e. short selling territory, much sooner than the global S&P500 index. These shares were candidates for short selling and for more declines already in times of bull or neutral US markets. A fear is much stronger emotion than greed and when decline starts then such move can be quick and huge. You should look for both types of possible trading trends, uptrend and also downtrend and trade them accordingly. 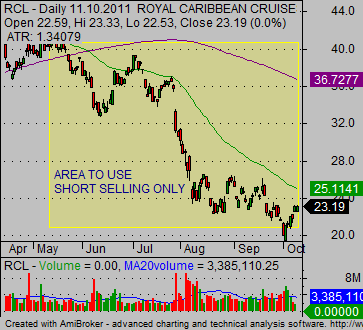 As you can see on the chart below, as shares of RCL entered bear stock market territory, then the only correct direction of the trade was to short sell. If only small part of the market is bearish then use pullback strategies to trade short-sell candidates. But if the global market or sector is negative, you can use also breakdown trades when looking at short sell trading opportunities. Always use stock screeners that present not only bullish but also bearish opportunities.